← What do the house builders really mean? 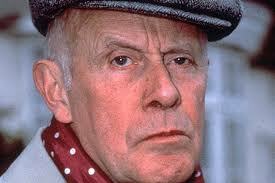 Even Victor Meldrew would have trouble with this defect! If this really is the case, how could a defect like this happen? Even worse, why was it not seen by anyone and corrected prior to legal completion? This defect was created at the first-fix stage. The door frame should have been packed off the wall nib using a timber stud to ensure the light switch would fit between the architraves later on. The light switch may even have been fitted in the wrong position altogether, at the very least the electrician should have noticed there could be an issue during his second-fix. The “dedicated site manager” didn’t check this stage of the build presumably! After drylining, the 2nd fix carpenter should have realised that the architraves would prevent the switch being fitted properly. The electrician clearly knew that this was wrong as he screwed back the switch, in fact the chances are he would have needed to use longer screws than those supplied with the switch! Then the painter must have realised this was wrong, yet painted the architraves anyway, in the full and certain knowledge that they would be removed to rectify this. 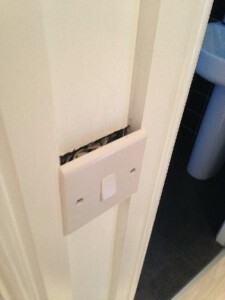 Following on, in all probability the cleaner and carpet fitted would have used this switch before handover too. Surely one of these trades would have mentioned it to the “dedicated site manager”? “We use efficient, effective and consistent processes to ensure that we get the basics right” …………….well not this time Taylor Wimpey! This is not the first time Taylor Wimpey has handed over a new home with a potentially dangerous electrical installation. At their Chariots development near Andover, a new home was handed over on 20 September 2013 with 27 electrical faults and defects despite the fact the home had an electrical inspection certificate. These were only identified after the buyer arranged to have the electrical installation reinspected by another electrician. Nine of the defects were classed as potentially dangerous! You also have to ask how the NHBC inspector could issue a CML final inspection certificate for this home considering this obvious, potentially dangerous defect? So what could and should have been done before legal completion? Prevention is better that cure, so packing the door lining away from the nib with a timber or using an architrave (narrow) switch would have been options. Failing this, someone should have notified the “dedicated site manager” and he should have got it sorted out. The architraves could have been removed and the edges planed down 3mm each and re fitted so the switch can be properly fixed back. Alternatively, the switch could have been changed for an architrave switch and the hole to the wall made good and redecorated. As it would appear no one cares on this site, what probably will happen now is the carpenter will try and chisel away a notch in the architrave so the switch can be fitted back flush with the wall. This entry was posted in New Homes, Snagging and Quality, Taylor Wimpey and tagged quality, snagging, taylor wimpey. Bookmark the permalink.